The Department of Spanish and Portuguese is pleased to announce the creation of the endowed Tim McGovern Fellowship Fund to honor the memory and scholarship of our beloved colleague and friend. The celebration of this achievement will take place on Thursday November 7, 2013 at 5:00pm at the Mosher Alumni House (Alumni Hall) during the 2013 Colloquium of Mexican Studies to be held November 7-9, 2013 at UCSB. 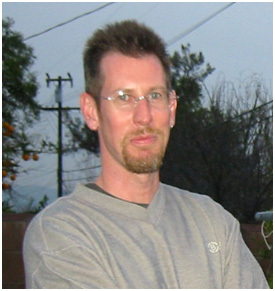 Tim McGovern was a talented and eclectic researcher. His books Dickens in Galdós (2000), Using Portuguese (2003), and Galdós Beyond Realism (2004) are considered important contributions to the fields of 19th Century Spanish Literature and Portuguese and Applied Linguistics. considered one of the freshest voices in Galician Studies and contributed to advance research in Mexican and Catalan literatures, and Gender and Queer Studies. He was also an integral part of UC Mexicanistas and had, as one of his core values, excellence in teaching. To honor his memory we are establishing The Tim McGovern Fellowship Fund to support graduate students' research projects in all the above mentioned areas and reward excellence in teaching.We look forward to see you there!